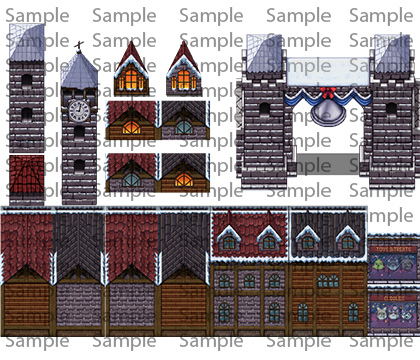 Winter Tiles for RPG Maker MV| RPG Maker | Create Your Own Game! Inspired by Winter Wonderland Tile Pack (for VX-Ace), this pack comes with fantastic new content perfect for creating beautiful winter scenes for your RPG Maker MV project! 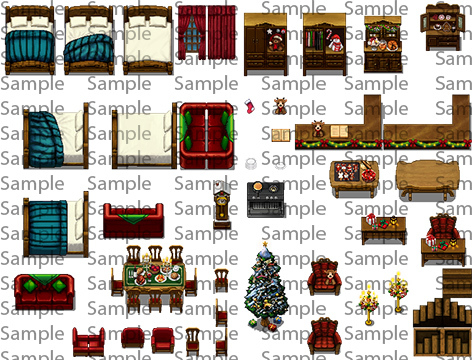 Tilesets in this pack are similar to Winter Wonderland Tile Pack (for VX-Ace), but there are new themes like interior tiles to create a cozy room for the Christmas season! Whether your heroes are looking for a lovely winter town to get some rest, or need a spot to celebrate the holiday season, this pack will inspire you with festive winter spirit! Tile B: Graphic tiles with fence, trees, chimney, window frames, street light and barrels are covered with snow! Also include signs, doors, snowman, Christmas garland and decorations, reindeer with sleigh and more! Tile C: Exterior tiles to create houses, buildings or stores to create a little town. Tile D: Interior graphic tiles such as bed, chest, hutch, sofa, table with food, chairs, oven, window, Christmas tree and more! Tile E: Includes some other unique graphics like Tee-pee tent, Igloo, cave entrance, 2 Animations of a fireplace and more!